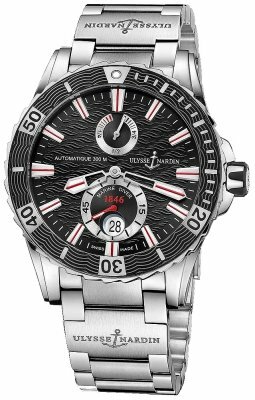 Take advantage of our discounted prices and receive free shipping when you shop our large selection of in stock Ulysse Nardin watches at Prestige Time. 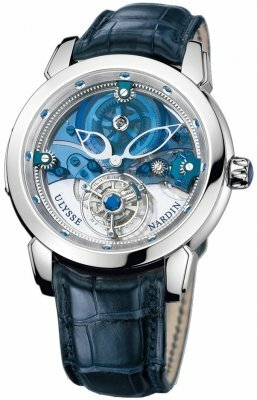 Ulysses Nardin was founded in 1846 in Le Locle, Switzerland. 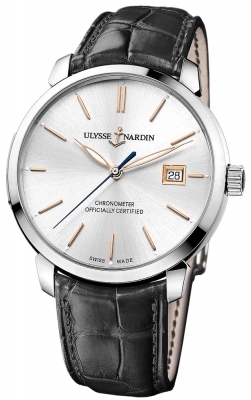 Ulysses Nardin watches are well known for their very precise Marine chronometers, the inspiration for the Ulysse Nardin Maxi Marine chronometer, Ulysse Nardin Maxi Marine Diver watch and the Ulysse Nardin Maxi Marine Manufacture watches which use their own in-house movements. 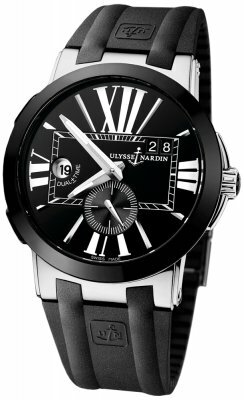 Buy a Ulysse Nardin watch today and save! 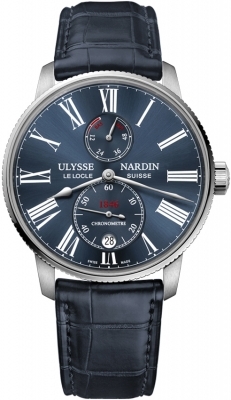 Ulysse Nardin watches was born in Le Locle, Switzerland in 1823. Following in his father's footsteps, he trained as a "remonteur" and eventually set up his own workshop. 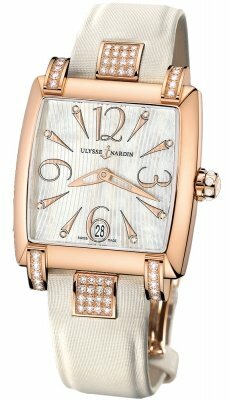 In 1846, the Ulysse Nardin Company was founded. Little more than a counter, its watches displayed high-quality craftsmanship and were signed by their maker. It was the beginning of an enterprise that has lasted more than 150 years. In 1996, the company's 150th Anniversary was celebrated with the introduction of the marine Chronometer 1846 as a wristwatch and the revolutionary Perpetual Ludwig was named after its creator, the brilliant and talented watchmaker/scientist, Dr. Ludwig Oechslin, the man behind the Astolabium series. 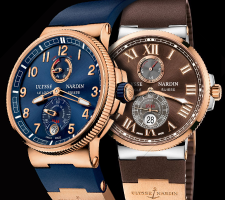 The single-button chronograph "Pulsometer" to commemorate Ulysse Nardin's birth in 1823 was introduced in 1998, yet this was eclipsed the following year when the firm debuted the GMT Perpetual, two unique and exclusive Ulysse Nardin creations integrated into one watch. No doubt the future will bring more delightful innovations from this highly prestigious watch manufactory, but what is certain to remain consistent is the company's dedication to producing only the finest quality timepieces such as the Kremlin, GMT Perpetual, Quadrato, Marine, Anniversary 160, Caprice, Michaelangelo, Ludovico, Specialities like the Minute repeater and Hour Strike and of course The Freak. 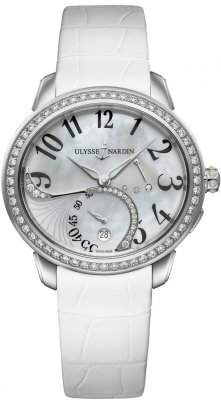 Popular collections of Ulysse Nardin watches include the Executive Dual Time and Dual Time Lady GMT +/- , Lady Diver Starry Night & the Classico Collection. 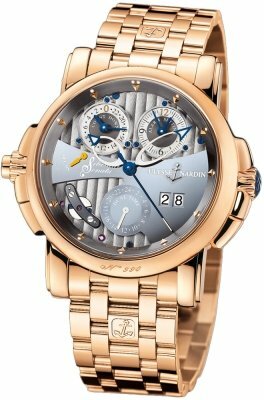 Ulysse Nardin also boasts the capability of producing more complicated watches such as the El Toro watch collection, GMT +/- perpetual calendars, Ulysse Nardin Freak watches & the Sonata watch. Featured special editions would be the Maxi Marine Diver Blue Sea, Black Sea. 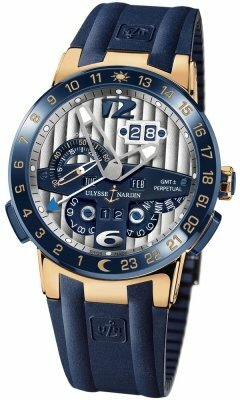 There are also some Ulysse Nardin limited edition watches, namely, the Black Ocean and Black Surf watch.